At the start of her senior year, alumna Rachel Adducci “freaked out” because she had no idea what she wanted to do after graduation. 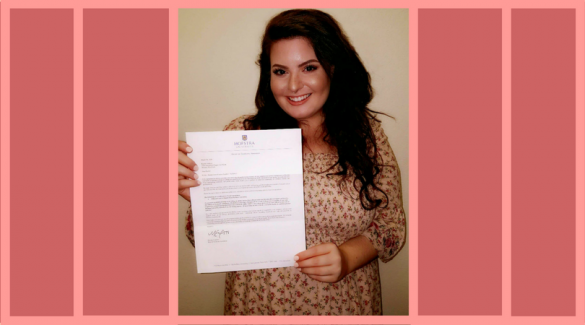 One year later, she has been accepted into New York’s Hofstra University’s forensic linguistics master’s program to pursue her dream job. Adducci, who hails from small-town Atchison, Kansas, spent her years at Newman being involved in various organizations. Some of these included working in the Academic Resource Center for three years as an English tutor and writing coach, being an active member of Justice League, a club for those interested in the social sciences, and Sigma Tau Delta, the international English honor society. Adducci also served as secretary for Pi Gamma Mu, the international honor society for the social sciences. She helped publish Coelacanth, a student literary journal, and served as copy editor, assistant editor, managing editor and writer for the Vantage student newspaper for two semesters. Adducci graduated in May with a Bachelor of Arts degree in English and a Bachelor of Science degree in criminal justice. 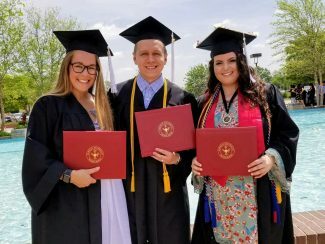 (From L to R) Taylor Mannis, Corbin Riley and Rachel Adducci each graduated in May with a Bachelor of Arts degree in English. 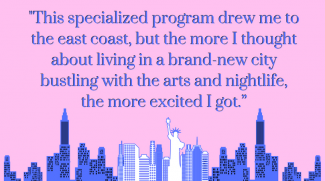 Adducci has never visited New York, but in August she will pack her bags and move to Hempstead — a town on Long Island just 30 minutes away from New York City. Despite her initial uncertainty, Adducci knew she wanted to continue her education after Newman. Adducci buckled down and took the Graduate Record Examination (GRE), as deadlines were approaching for the two other graduate schools she had applied for. However, she received rejection letters from both schools and felt disheartened at the idea of applying to such a prestigious program at Hofstra, she said. “The application process was fairly straightforward, but I felt pressure to make this my best application yet,” Adducci said. “(Newman professors) Dr. Susan Crane-Laracuente and Kristi Edwards felt the same way because both of them offered numerous suggestions and edits while I was drafting my personal statement. I probably wrote my whole personal statement three times and edited each one at least twice, as per my professors’ suggestions. “Eventually, I thought my personal statement perfectly represented who I am as an academic, and the director of the forensic linguistics program at Hofstra was impressed,” she added. Two days after submitting her application, Dr. Robert A. Leonard, director, Institute for Forensic Linguistics at Hofstra University, emailed Adducci to set up a phone interview. He thought Adducci was the perfect fit for the program, she said. “I’ll be studying forensic linguistics, which is a specialized master’s program to train students to be linguists first and foremost, but also trains them to analyze language in legal senses,” Adducci said. “Essentially, while I’m learning the science of language, I’ll be applying what I learn to real-life criminal cases and legal examples. Adducci said she is most excited to start her classes, “as weird as that sounds.” She will be taking “Phonetics and Phonology,” “Sociolinguistics” and “Language & the Law: Language as Evidence” in fall 2018. In addition, Adducci says she is excited for the internship aspect of the program, which includes working on actual cases with the director of the program who assisted in the JonBenet Ramsey case. “The professors at Newman have more than prepared me for this next step,” Adducci said. “They saw such potential in me from the moment I arrived on campus, and I am so grateful for that. The English department, especially, helped me to find my voice. 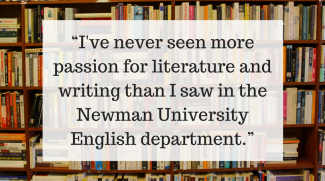 “I’ve never seen more passion for literature and writing than I saw in the Newman University English department,” Adducci said. “Dr. Marguerite Regan really helped knock me down a peg when I thought I could produce something perfect on my first try, which is why we write, rewrite and rewrite again in English classes at Newman. I felt inspired every time I visited Dr. Susan Crane-Laracuente’s office and saw stacks of students’ papers, probably filled with incredible and meticulous feedback for each person. Dr. Bryan Dietrich helped me feel confident in my analytical skills and fall in love with poetry. Adducci always thought she would go into editing, but felt that she was missing something, she said. Crane-Laracuente said that she was often delighted by Adducci’s “inquisitiveness” — particularly in conversation in and after class. Adducci said that while she is excited to live in New York, she is incredibly nervous about the public transportation aspect — as it is not something she has much experience with. “I’m not the best at directions, so I’m hoping that I make friends quickly so we can all struggle together to navigate the city,” she said.